The past week has been varied doing a few different fun things but having to put up with some really annoying weather. All week the weather has been scorching hot through the day, reaching 36 degrees one day, and then big thunderstorms in the afternoon. Even worse was the fact that through the week the rain-snow limit was around 4200m. This weather, with a cheeky back-hander, hit the faces really hard just as they were starting to build up for this rapidly approaching Autumn. I went for a quick stroll by myself along the classic Midi-Plan traverse last Saturday. This was the start of this melting pot which we were stuck in all week. As it was really sunny I thought I should be careful being in the sun's very strong rays, so I went and got myself a sun hat from the market! 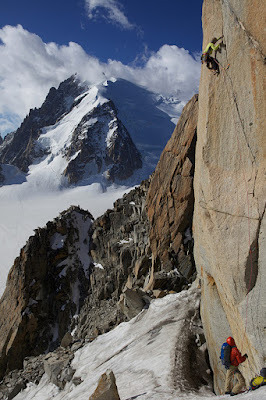 On Monday Dave and I climbed on the west face of the Blatiere. The face sort of has two sectors to it, The Red pillar and The Grey pillar. Named for quite obvious reasons. 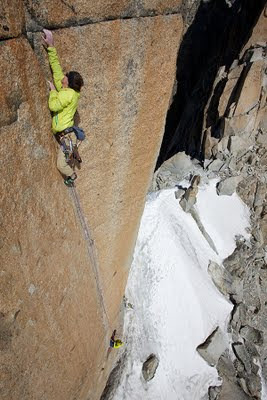 Dave had done the classic route 'Majorette Thatcher' which climbs a rib up the Red pillar. So we went to the Grey pillar and looked at a route called 'Fidel Fiasco'. The route was awesome and has so much variety of climbing in it, the crux was a very thin slab which has no features to climb but just these crystals you have find. This pitch was protected by very spaced bolts giving it a lot more excitement which was not needed. We climbed all but the last two pitches due to the weather creeping in on us, which we timed perfectly getting back to the lift station just as the down pour started. One idea that Dave I had was to go through to Italy to climb on the South side of Mt Blanc, but again due to this very mixed weather we decided it might not be a great thing to do. So instead we went at slept at the Midi to head for the Classic Gervasutti Pillar. As we were up there watching the heavy clouds dominate the slopes, we got a updated weather forecast which neither of us were pleased with to go and climb this massive pillar. So we headed back down the next morning. Dave on the first pitch. I got a call from Jon asking if Dave and I were keen to go and have a look at 'Digital Crack', an 8a sport climb situated on the Cosmiques Arête which must make it one of the highest 8a's in the world. Jon was keen to get shots of this magnificent route. We got some great shots and I got spanked on it! 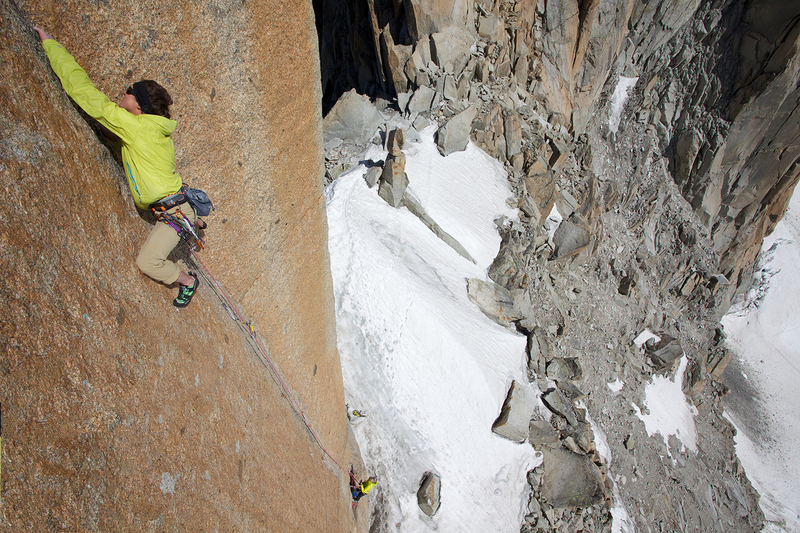 The thing is really hard and a lot of people are saying it's 8a+. I had a great training day on Friday, starting with a run up the Zig-Zags, 1000 metres of switch backs taking you up to Plan Praz. 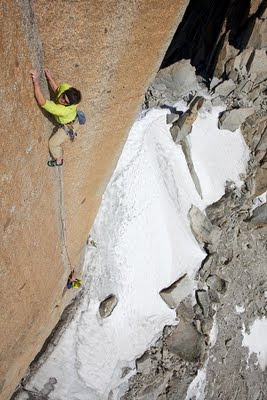 Then Jon, Dave, Will and Myself went for a Dry tooling session at the 'Zoo'. I've never really gotten psyched for dry-tooling and I have tried to avoid it as much as I could because I'm quite weak at deep locks, and this is a crucial thing in 'Thai tooling'. But you have to work your weaknesses so I went down to the Zoo and actually had a great time. I managed to do a couple of reps on a M6 then had a go at a M8+. I got to use my new pair of 'M14' gloves that Rab supplied my with. These gloves are really comfy and great to wear when hanging on axes due to the padding patches on the outside edge of the pinkie. So know I'm actually really keen to get back down there and get strong on the tools, which will definitely help for this winter. Dare you to wear that hat doon the Prom!